Dubai, UAE - 6 February, 2019: Hoda Barakat, Adel Esmat, Inaam Kachachi, Mohammed Al-Maazuz, Shahla Ujayli and Kafa Al-Zou’bi have today been announced as the six authors shortlisted for the 12th International Prize for Arabic Fiction (IPAF). Each of the six shortlisted authors will receive $10,000. 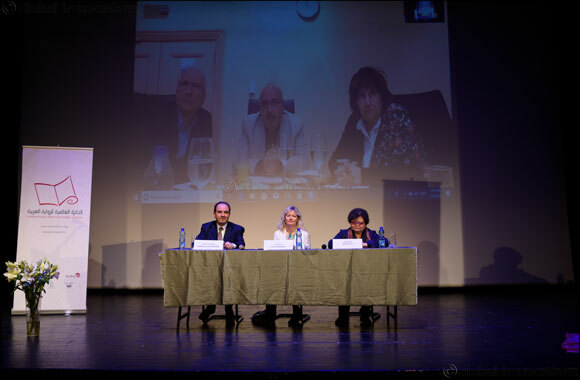 The books were revealed by the judging panel during a press conference held at the Palestinian National Theatre – El-Hakawati in Jerusalem. The judges who were unable to travel to Jerusalem joined via video link. Each year, the shortlist is announced in a different centre of Arabic writing and for 2019 the Trustees of the prize chose Jerusalem, along with Ramallah and Bethlehem, for a series of events in recognition of the flourishing Palestinian literary scene. The prize has been delighted to reward a number of Palestinian writers over the years, including former winners Ibrahim Nasrallah and Rabai Al-Mahdoun. Three female authors who have been recognised by the prize before have made the 2019 list, including Inaam Kachachi (shortlisted for The American Granddaughter in 2009 and again in 2014 for Tashari); Shahla Ujayli, the youngest on the list (a participant in the prize’s Nadwa in 2014 and shortlisted for A Sky Close to Our House in 2016); and Lebanese Hoda Barakat (longlisted for The Kingdom of the Earth in 2013). These three authors are competing to win the $50,000 prize with the acclaimed Egyptian novelist Adel Esmat, whose 2015 award-winning Tales of Yusrus is already available to read in English; Moroccan political anthropologist Mohammed Al-Maazuz, who reaches the list with his second novel; and Jordanian writer Kafa Al-Zou’bi, who is shortlisted with her fifth novel. With four women shortlisted, this year has the highest number since the prize began in 2008 (there were two women in 2011, 2015 and 2018). This week, to celebrate the shortlist, the International Prize for Arabic Fiction will host a series of events across Palestine in partnership with the British Council and The Educational Bookshop. This will include a reception this evening in Jerusalem and two panel discussions on this year’s shortlist, the Palestinian literature scene and the translation of Arabic novels, with IPAF judge Zhang HongYi, Chair of Trustees Yasir Suleiman, Prize Administrator Fleur Montanaro and author Walid Shurafa. The first discussion is a public event at the Khalil Sakakini Cultural Center in Ramallah on Wednesday 6 February, and the second is a student event at Bethlehem University on Thursday 7 February. This year’s six shortlisted novels, selected from a longlist of 16 and published in Arabic between July 2017 and June 2018, showcase the best of contemporary Arabic fiction, exploring issues of belonging, societal changes over generations of Arab families and the ongoing battle against the fundamental flaws of human nature. The Night Mail tells the stories of immigrants, exiled and homeless, who have each written a letter that is now lost like themselves. The Outcast is based on a true story and spans the history of modern Iraq tracking the life of a female journalist forced to flee her country. Cold White Sun reveals the alienation of a young intellectual Jordanian man from conservative society in Amman. In Summer with the Enemy we learn about three generations of Syrian women in Raqqa through the recounting of a historical courtship. The Commandments follows an Egyptian family and the life lessons passed down from grandfather to grandson to help him avoid temptations. What Sin Caused her to Die? shares the story of a divorcee who tries to use the beauty of philosophy and music to resist her depression. Alongside Charafdin Majdolin (Chair), a Moroccan critic and academic specialising in Aesthetics, Verbal and Visual Narratives and Comparative Studies, this year’s judging panel features Fowziyah AbuKhalid, a Saudi Arabian poet, writer, academic and researcher in social and political issues; Zulaikha Aburisha, a Jordanian poet, columnist, researcher and human and women’s rights activist; Zhang HongYi, a Chinese academic, translator and researcher; and Latif Zeitouni, a Lebanese academic and literary critic with a specialisation in Narratology. The winner of the International Prize for Arabic Fiction 2019 will be announced at a ceremony in Fairmont Bab Al Bahr in Abu Dhabi on Tuesday 23 April, the eve of the Abu Dhabi International Book Fair. Last year’s winner was The Second War of the Dog by Ibrahim Nasrallah. Fulfilling its ambition to increase the international reach of Arabic fiction, the prize provides funding for English translation for its winners. Winning novels published in English last year included Rabai al-Madhoun’s Destinies: Concerto of the Holocaust and Al Nakba (Hoopoe Fiction) and Ahmed Saadawi’s Frankenstein in Baghdad (Oneworld in the UK; Penguin Books in the US), which was shortlisted for the Man Booker International Prize 2018. Also available in English are Baha Taher’s Sunset Oasis, Youssef Ziedan’s Azazeel, Abdo Khal’s Spewing Sparks as Big as Castles, Mohammed Achaari’s The Arch and the Butterfly, Saud Alsanousi’s The Bamboo Stalk and Raja Alem’s novel The Dove’s Necklace. This year sees the publication in English of several novels recognised by the prize, including Mahmoud Shukair’s Praise for the Women of the Family (shortlisted in 2016), translated by Paul Starkey, published by Interlink and out now; Sinan Antoon’s Book of Collateral Damage (longlisted in 2017 as al-Fihrist), translated by Jonathan Wright and published by Yale University Press in May; George Yaraq’s Guard of the Dead (shortlisted in 2016), translated by Raphael Cohen, and Ibrahim Abdelmeguid’s Clouds over Alexandria (longlisted in 2014), translated by Kay Heikkinen, both published by Hoopoe in May; Dima Wannous’ The Frightened Ones (shortlisted in 2018), translated by Elisabeth Jaquette and published by Harvill Secker in July; and Ismail Fahd Ismail’s The Old Woman and the River (shortlisted as Al-Sabiliat in 2017), translated by Sophia Vasalou and published by Interlink this autumn. The International Prize for Arabic Fiction is an annual literary prize for prose fiction in Arabic. It is sponsored by the Department of Culture and Tourism – Abu Dhabi (DCT Abu Dhabi) and is run with the support, as its mentor, of the Booker Prize Foundation in London.